Dr. Curt Hinson, who is well-known as “Dr. Recess,” taught our Vaughn students new games that focus on keeping students active, working together in partners and as a team while having fun. His focus is on health, fitness, nutrition, and developmentally appropriate play for kids. Some of the ways that our students and school will benefit from Dr. Recess are less conflicts on the playground, better use of recess time, new fun and exciting games, more participation during recess, fewer playground injuries, and a reduction in bullying as well. One of our Vaughn campus goals is to have some structures in place to help facilitate recess. I believe that the knowledge from Dr. Recess will help our school move in this direction! We had two assemblies when Dr. Recess came to our school. One assembly was for K-2nd grade and the other was for 3rd-5th grade. Each assembly lasted for 45 minutes. During that time, Dr. 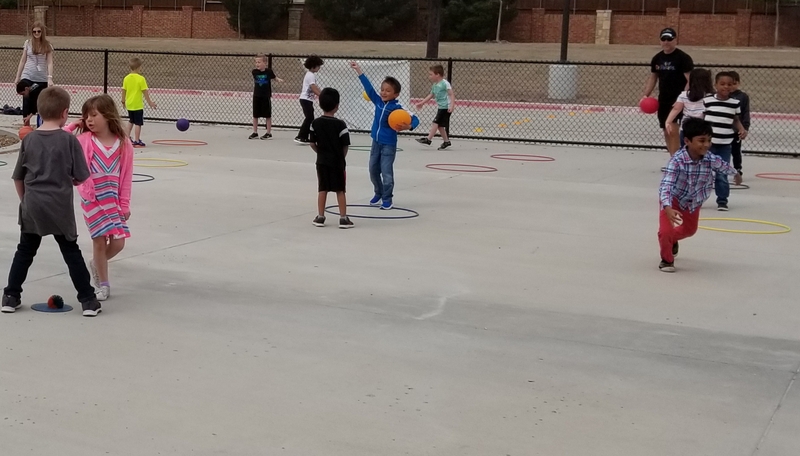 Recess modeled a variety of games for our students ranging from different ability levels as well as the number of students that can participate in each game. He had our students help with the demonstrations and he was able to call those students by their names when finished. Dr. Recess had a fantastic rapport and did an amazing job making connections with students as well as teachers. He then stayed outside during each recess (K-5th) and helped students and teachers with the recess games that were taught in the morning. When I was outside one of our students said to me, "I just love all of the new games Dr. Recess taught us. I am excited about recess again!" When I heard that I knew without a shadow of a doubt how lucky we were to have Dr. Recess to come to our school! Dr. Recess might have only been at Vaughn for a day, but the impact that he has made on our students will be life-long! Using the money from "Healthy Zone School" to buy my school's recess equipment just made everything come together. Now students will have the equipment that they need to implement all of the games that were taught. I am excited for what's to come and all of the successes that happen during recess time!